« Previous: The wait is over! Custom Compiler Layout Assistants – part 1. On March 30th Silicon Valley was buzzing with excitement. Synopsys held the Silicon Valley SNUG event and revealed Custom Compiler, a fresh approach to custom design that employs visually-assisted automation technologies to speed up common design tasks, reduce iterations and enable reuse. During the event the R&D folks did a walkthrough of the technology ‘under the hood’ and showed the audience some cool layout assistants that leverage the graphical use model familiar to layout designers while eliminating the need to write complicated code and constraints. One of the layout assistants that was shown was the symbolic editor. This really is a must have assistant when it comes to placing devices that need to be in a specific interdigitated pattern like for example a differential pair. In the schematic it is two symbols but in the layout it could be hundreds of devices. The symbolic editor allows device placement to be edited in an easy and graphical manner and comes with a rich collection of pre-defined placement patterns. If you find a placement pattern you like you can simply use it as is and the symbolic editor will generate a correct by construction placement that you can instantiate in you layout. If you don’t find an exact match you can easily use a pattern that is similar to what you need and rearrange the placement pattern graphically. No constraints to enter, no code to write and layout is done in minutes versus hours. Through the symbolic editor the layout engineer can make simple graphical choices of how the layout needs to look and then have the placement taken care of by the placement engine. You can easily add or remove placement rows and columns as well as insert dummy devices. The symbolic editor also supports device merging and splitting and is the fastest way to achieving correct layout. 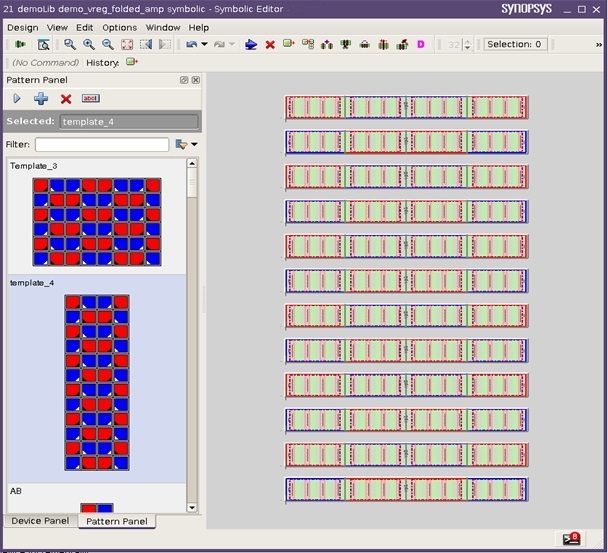 The symbolic editor is particularly well suited for FinFET based designs and is equally as good on planar CMOS nodes. Generating the devices and placing them such that they meet all the design rules and will produce a robust working design is about 30% of the layout time. Using a layout assistant like the symbolic editor really speeds this task up and allows the layout engineer to gain back some of the productivity that gets lost due to the complexity of the FinFET process. Register here for a webinar on Custom Compiler. Next we will take a look at another layout assistant, but that’s another post. Welcome to Custom Layout Insights! Our goal is to use this blog to discuss how we can drag custom layout into the 21st century by looking to the past for inspiration and the future for innovation. I encourage you to chip in with your 2 cents. I started in EDA before it was termed EDA. It was simply Computer-Aided Design back in 1977. I was working at GEC Traction in Manchester England (yes, I am a Brit) doing control gear for locomotives. It was all heavy duty relays and contactors back in those days. Then came the electronics revolution and with it came the first CAD system. It was a CALMA GDS1 system with green vector refresh displays and huge digitizers for entering the data. It was amazing what you could do with a Data General Eclipse computer and 16K (yes, Kilobytes) of core memory! Pretty soon I was running the CAD system, which at the time was one of the largest in Europe, if not the world. CALMA was expanding and I was recruited as an applications engineer. That was it; I was in EDA and have been ever since. I have held marketing and sales positions at Silvar Lisco and Neolinear and I have been chasing the holy grail of analog/custom layout automation ever since I ran marketing for Virtuoso at Cadence back in 1995. Past experience tells me we may never find the Holy Grail, but there is light at the end of the tunnel. Follow this blog and see how we at Synopsys are progressing.